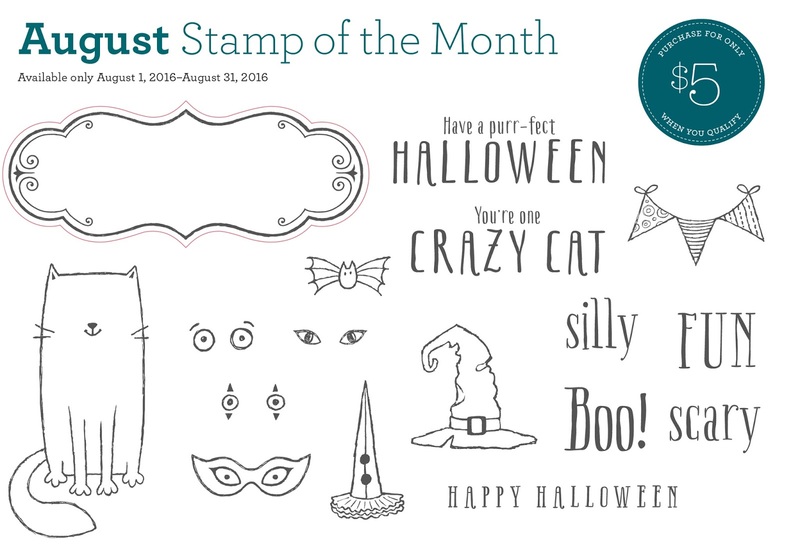 Welcome to the Stamp of the Month Blog Hop! If you arrived here from Sheila Bennett's blog, you're on the right track! If you get lost along the way, you can find a complete list of hoppers here. 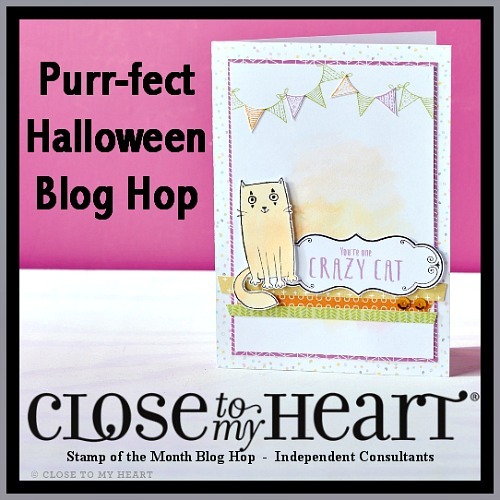 This month, we're featuring this amazing Purr-fect Halloween set! It's so adorable! 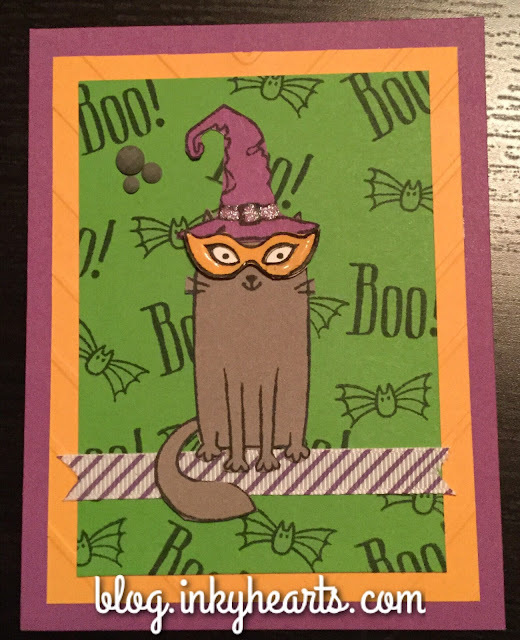 My favorite Halloween color combo is purple-orange-green, so I decided to feature some of our new colors in this project! Ladies and gentlemen, I'm pleased to introduce you to Pansy, Tangerine, and Willow--three brand, spankin' new colors in our Adventure palette! If you look closely, you'll see that I've added an accent of Liquid Glass onto her mask to give it a little dimension and used our brand new Shimmer Brush to give her hat band a little glitz. I also ran the piece of Tangerine cardstock through with our new Simple Chevron Embossing Folder. Finally, I added a piece of our new Pansy Striped ribbon from the Adventure Ribbon Pack. Before you go, please scroll back up and check out her precious little toes! I just can't get over them! 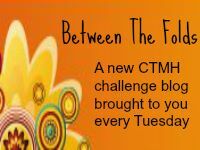 Next up, please visit Maureen's Something to Scrap About blog. Cute kitty! Love the dimension that the Liquid Glass adds to the mask. Love the addition of liquid glass. It's always the details that someone adds that draws me to the card. That is really cute! And I had never heard of Liquid Glass - definitely something new to try! I love the background you created with the small stamps from this set! The application of Liquid Glass on the mask is really creative. So very cute, loving the cats! Perfect background for your cat! Super cute! 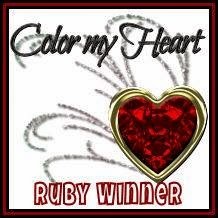 I love the random stamped background and the added shine. Love the background you created with the random stamping. That's a great colour combo!! Great card! I love the color combination and the background stamping is perfect for you card! Cute card! The new colors are beautiful!